How Does Mobile Technology Work? Home > Equipment > How Does Mobile Technology Work? Mobile phones may be the most common electronic device in the world, but their ubiquity has led to their ingenuity being taken for granted - so how does mobile technology work exactly? Internet Surfing, Video Calling, Downloads… but What About Basic Communication? With modern mobile phones able to surf the Internet, take photographs, carry out video or music downloads and even video calling, it’s easy to forget that its primary function is in enabling individuals around the globe to communicate with one another. And connecting two voices many miles apart is a role they carry out with remarkable efficiency. Mobile phones operate using radio signals in much the same way as radio and television. When someone speaks into a mobile phone their voice is converted into radio waves, or radiofrequency (RF) signals, which are then transmitted to a nearby low powered radio transceiver called a base station or mast. Once picked up by the station, the voice signal is then sent across the communication network to the base station closest to the intended recipient. The radio waves are then transmitted by the local station and picked up by the receiver’s mobile and converted into voice, thereby completing the magical connection. This may sound like a rather long-winded journey but of course the ingenuity of mobile technology means it all happens in the blink of an eye. To understand how a mobile network works it helps to imagine the whole UK landscape divided up into individual interlinked cells, with each represented by a central base station. If someone makes a call whilst situated in one particular cell then the signal will be transmitted to its base station for redirection around the network. If, whilst calling, the user happens to move into a different cell then the new base station will take over responsibility for the transmission of the call. The size of these cells varies according to the density of mobile phone users in that specific area. In the countryside, where much fewer calls are made, the cells are larger, with one base station able to cope with a 10 km radius. However in urban areas, the cells are much smaller because a greater density of base stations is required to handle the increased number of people making calls at one. For instance in a town, one base station might be situated only 500 metres from the next. This network of cells and base stations is linked up to the public telephone network, thereby enabling mobile calls to connect up with other networks or countries around the globe. The UK mobile phone network is made up of approximately 51,000 base stations. Two thirds of these are integrated into the design of existing structures whilst the remainder are mounted on high structures such as a pole or tower. 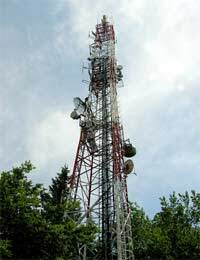 Their equipment each comprises of microwave antennas and transmission dishes. The power of each base station transmitter needs to be carefully controlled to avoid equipment interference. This is done by grouping neighbouring cells into ‘clusters’, in which each station operates at a different frequency, such as 900, 1800 or 2100MHz. These frequency groups can then be re-used in other clusters where they are not liable to cause interference.